Rocket Math Free Homeschooling Downloads . 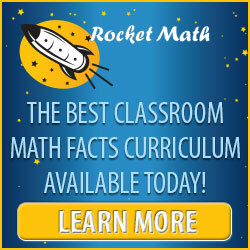 Rocket Math Free Homeschooling Downloads . Rocket Math – Blast Off to Math Mastery! Dr. Don Crawford don@rocketmatch.com R&D Instructional Solutions (The home of Rocket Math) 3439 NE Sandy Blvd. #359 Portland, OR 97232 Toll free: 888-488-4854 www.rocketmath.com by Michael Leppert Rocket Math is a ten-minutes-a-day, paper and pencil, worksheet-based, supplemental, math facts practice curriculum. It is a uniquely structured curriculum for the sequential practice and mastery of math facts. Students learn 2 facts and their reverses on each worksheet in a carefully controlled sequence which enables mastery at an individualized pace. Students practice orally with a partner every day. One minute timings assess when students are ready to move to the next set of facts. Rocket Math was designed by teachers to offer a simple, easy-to-follow daily practice routine for the memorization of basic math facts in all four actions – addition, subtraction, multiplication and division. We all know that creating a new habit pattern is difficult and even more so for young people! With Rocket Math, your child becomes accustomed to the daily six-to-seven-minute routine and quickly sees progress at his/her own pace! This success stimulates the desire to continue to work the program and gain more success. Math is no longer a chore, but a pleasure. If you have an only child, you can serve as the partner, since Rocket Math’s daily practice requires less than ten minutes. This hands-on parent-teaching is the heart and soul of homeschooling, anyway, so Rocket Math fits perfectly into the homeschooling paradigm. The Rocket Math program also offers five progress-monitoring tests for each action. These are two-minute timed tests of all of the fact presented and are designed to be taken every two weeks and have the student graph the results on blank graph paper that is provided. This gives the student hands-on experience with graphing and an overview of his/her progress. The Rocket Math website, www.rocketmath.com, offers free downloads, purchasing details, blogs and loads of other resources related to math learning. Please visit it to address your math teaching issues and blast off to mastery!